I cooked last night in memory of Linda Gordon, my generous friend and frequent dining companion. 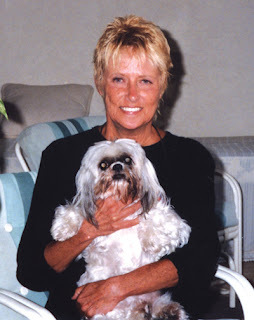 Linda was a well respected journalist who was writer and part owner of an Ocean City, Maryland newspaper, then served admirably as restaurant critic and journalist for the Naples Daily News for 12 years. She retired and subsequently wrote, with her lively style, over the past year for Gulfshore Life Magazine, and was recently offered an assistant editorship. She passed away Monday, Nov 12 from sudden complications from an accidental fall, and is survived by Lilybelle, her devoted Shih-Tsu. While a poolside party shall be soon enjoyed in her memory by her many friends, last tonight, feeling her presence, I had the desire to cook and share two things she’d like. “We” started with the Mussels, Curry, Cream and Wine Mouclade, a recipe minimally modified from Chef Laurent Tourondel's book “Go Fish- Fresh Ideas for American Seafood”. I earlier started the hours- long simmering Lamb Shanks with Guinness Draught, which was refrigerated overnight, and served as the hearty main course. A mouclade is a regional French mussel dish in which the mussels are cooked just as they are for moules marinière, or mussels steamed in white wine, with shallots, garlic, and herbs. 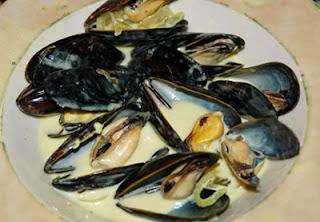 To make a mouclade, the cooking liquid is thickened with cream and the mussels are served on the half-shell, topped with a spoonful of the sauce. 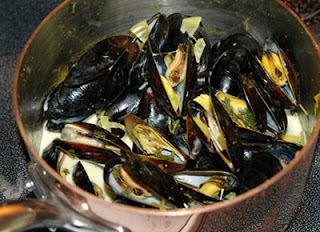 COOK THE MUSSELS --Put the wine, shallots, garlic, and curry powder in a saucepan and bring to a boil over high heat. Add the mussels and parsley, cover, and cook until the mussels open, approximately 3 minutes. Drain the mussels in a fine-mesh strainer set over a pot. Discard any mussels that have not opened. MAKE THE SAUCE--Reheat the strained liquid over medium heat. Stir in the cream and cornstarch, and season with salt and pepper. SERVE --Return the mussels to the pot and bring the pot to the table. 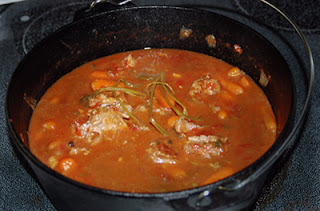 I found it tasty, and added a small pinch of cayenne pepper to give it a little heat,. If I were to do it again for 2 lbs, rather than the intended 6 lbs of mussels, I’d reduce the 2 cups of wine by boiling, down to just over 1 cup, or add more cornstarch, to yield a richer tasting and thicker sauce. I used live mussels, which were tasty but small bodied. Next time, I might try using frozen New Zealand green-lipped mussels, which have proportionately quite large bodies in their shells. Traditionally, some French chefs add the curry at the end, before serving. The cornstarch is not a French thing, and the thickened dish may be better termed "Poulette de Moules au Curry". Mussels, sans parsley garnishing. The Lamb Shanks with Guinness recipe serves 4, and comes from Mary at ceresandbacchus.com. This recipe is termed a "Navarin Printanier aux carrots nouvelles" by my scholarly French friend. Sprinkle lamb shanks with salt and pepper. Heat an enameled or cast iron Dutch oven over high heat for 8-10 minutes. Add oil, heat oil to almost shimmering heat, then add lamb shanks. Let them get brown and unstuck from the pan (on their own) before turning to brown them on another side. (Click on "Lamb Shanks with Guiness" above for rest of recipe.) Make this a day ahead of time-it tastes better the next day, and you can remove any fat from the top of the sauce before reheating it. I added a tiny pinch of cayenne pepper powder to the recipe to give it just a little heat (not a French touch! 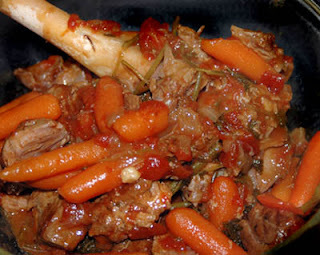 ), and boiled down the liquid for a while, with the lamb and carrots removed, as it was a touch watery. After resting overnight in the fridge, it was oh-mi-gawd delicious, served the next day. I cooked it a second time, later, added some ground cumin (like a lamb tagine), and simmered, with no top for the last 2 hours, to concentrate the flavor and thicken the liquid, and didn't need to add flour. Mary, thank you for sharing a superb recipe. Linda, you left a wonderful legacy. Your friends feast, drink, and joyfully celebrate your life. The Celebration of Life, in Memory of Linda Gordon, will be held at Saturday, February 2nd, 2008, 3 pm, at Moorhaven Apartments, 2102 Alamanda Dr. Naples, FL 34102. Catering will be done by Dino's Restaurant. This street is parallel to US 41, and behind the Office Depot, booksaMillion Plaza, across from the Coastland Mall.